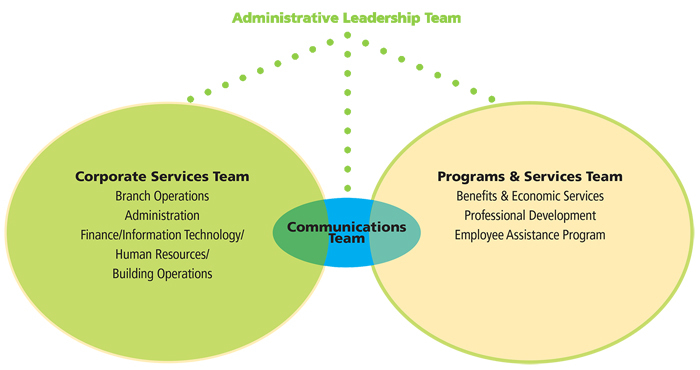 As the diagram indicates, there is significant collaboration between the programs and services, corporate services, and communications teams in the day-to-day operation of the NLTA. An Administrative Leadership Team, comprised of lead staff in various functional areas, is utilized to assist the Executive Director and lead the operational activities of the Association in order to accomplish the mission statement of the NLTA and to action the policy and decisions determined by the BGM, Joint Council, and the Provincial Executive. The Programs and Services Team provides services to teachers related to professional development, benefits and economic matters, and the employee assistance program. The Corporate Services Team provides the business and corporate services required to operate the organization, specifically finance and administration, staff human resources, information technology, building operations and branch operations. The Communications Team is integral to the work of both the Programs and Services Team and the Corporate Services Team and is responsible for all aspects of the NLTA’s internal and external communication and public relations. The Executive Director is the Chief Administrative Officer of the Association and is responsible for the coordination and implementation of all NLTA programs. This includes maintaining a liaison with other provincial and territorial teacher organizations and with the Canadian Teachers’ Federation to monitor and assess provincial and national developments and trends affecting education. The Executive Director is staff consultant to the President, the Provincial Executive and Table Officers, and with the President, represents the Association on most liaison committees with other educational organizations. He/she also has overall responsibility for the operation of the Association’s head office based in St. John’s.